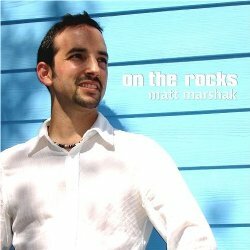 ... we're spotlighting guitarist Matt Marshak and a trio of delectable selections from the On The Rocks release and we'll be presenting those as part of the showcase feature. Hour 2 brings Fresh Trax with all the latest and best in new music and, as we crack open another 5-pack of fresh listening, headlining are Brian Culbertson and Ken Navarro. Additionally there are brand new selections from Terry Disley, Denny Jiosa, and Gabriel, so this is one segment that's not to be missed. Then just a bit later that very same hour, we're balancing the new with the tried and true - this time that includes "blasts from the past" by Thom Rotella, Marion Meadows, the hip and funky band known as Bona Fide as well as the legendary Jean-Luc Ponty. Otherwise, the remainder of the show is peppered with spicy selections from David Benoit, Steve Oliver, Paul Brown, and Brian Simpson! You know it's gonna be great! 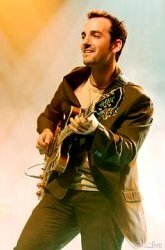 In spite of the fact that Long Island native Matt Marshak didn't start guitar until he was 17, within a few short years he's laid the groundwork for a highly promising career while emerging as a standard-bearer for a new generation of young performer. His 2001 debut entitled Preservation was a bit of a nod to the legacy of bands such as The Jazz Crusaders, even though simultaneously Marshak was exploring new musical avenues. Then a short time later, while in the midst of recording his sophomore effort, Marshak was named the Best New Smooth Jazz Artist in all of New York City thru a contest sponsored by the now defunct WQCD. This dynamically boosted Marshak's profile whereupon This Time Around received worldwide airplay - meanwhile we here at The Café were quite simply floored as the project landed squarely among our top ten most played albums for 2004. From that point, it's been ever onward and upward for Mr. Marshak! Marshak's follow-up entitled Groovosphere, spawned the hits Summerfunk and Montauk Moon, two of our most played tracks for '06. Meanwhile, on a much broader stage, the project created performance opportunities across the US, as well as around the world. Consequently, it's really not surprising to see Marshak now take his craft to the next level by incorporating the invaluable experience gained thru his extensive touring. Therefore, it's with great pleasure, that we proudly present Matt Marshak's On The Rocks as the focus for our showcase feature! We've chosen three delicious tracks beginning with Bratislava Bop, the title no doubt being an allusion to Marshak's days spent touring the Slovak capitol and a selection wherein European charm combines with a subliminal groove. On the other hand, as we open hour two, West Coast Stranger is a moody gem with an intriguing ambiance and represents one of Marshak's prettiest efforts to date. Meanwhile, for the title track On The Rocks, Marshak returns to the precepts of his debut perfectly balancing hipness with the driving rhythm of the acoustic bass Regardless, whether it's straight-up or "on the rocks" if you will, Marshak arguably delivers his finest and most consistent effort to date! 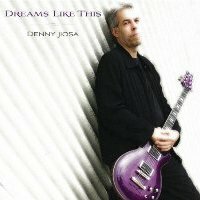 In the mid 80s, Huntington, Indiana native Denny Jiosa moved to LA to attend GIT - meanwhile he further honed his chops by studying privately with Frank Gambale. After relocating to Nashville, Jiosa did a variety of sessions before accepting a management position at a recording studio - in this capacity he's garnered three Grammy nominations for his work with gospel vocalist Yolanda Adams. In the meantime, Jiosa launched his solo career in 1995 with a top ten album while his follow-up release went all the way to #5. This combination of factors now all come into play with the recent issue of cd #6 in Dreams Like This. From that effort, we've selected Just the Thought of You; Jiosa does double duty on the track adding some very impressive vocal stylings to his always-impeccable guitar work! As little more than a tiny tot growing up in Decatur Illinois, Brian Culbertson listened to many of the top R&B bands of the 70s on headphones that his dad gave him. 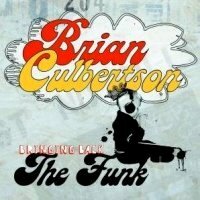 It was the music of Earth Wind & Fire, Parliament, Sly & the Family Stone, and Tower of Power, among many others, that inspired Culbertson to release Bringing Back the Funk, his tribute to the music of that era. Since bursting onto the smooth scene back in '94, Culbertson has been considered one of the young lions of the movement. With this latest effort and 10th overall, it is now indeed his time to roar; from Bringing Back the Funk, we've selected Let's Stay in Tonight, a Culbertson original that easily rivals many of the vintage selections from "back in the day"! Based on Canada's west coast, Gabriel Mark Hasselbach brings his "A game" to his latest release. Formerly a member of the Powder Blues Band, Gabriel has continued to hone his craft in the ensuing period. 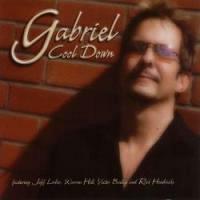 Following a "smoothie" nomination at the Canadian Smooth Jazz Awards for his previous release, Gabriel is now rightfully joined by some of elite in genre including Jeff Lorber. The groundwork for their collaboration actually extends back to 2006 and, resulted in Lorber co-writing many of the selections while contributing guitar and bass as well as his customary work on keys. Cool Down is the result and from that endeavour, we're playing East Coast with Warren Hill guesting on the selection! Formerly the keyboard player for Acoustic Alchemy, Terry Disley is no stranger to our humble program as two of his releases have nestled into our top 10 most played albums for their respective years. The classically trained jazzer reached #4 on our in-house list of favourites with his 2004 debut while his sophomore Across The Pond follow-up snagged top honours for 2007! 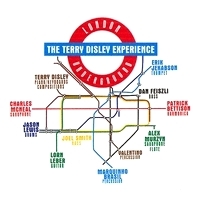 Nonetheless, Terry decided not to try and fit the radio format this time round, feeling he could deliver longer, more complex tracks, and in his words "more serious compositions" that would "take people just a bit deeper into the land of Disley", pun intended! Truer words were never writ, as Disley's latest called London Underground couples intricate arrangements with artistry of the highest calibre! From a cd that falls well outside the ordinary, we have the intriguing ebb and flow of Out To Sea! A favourite on our humble program since the early days, few players in the genre if any, have as consistently delivered as tasty and upbeat a series of releases as has Mr. Navarro. 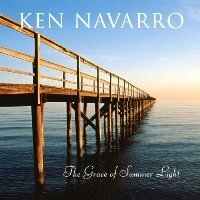 The Grace of Summer Light is his latest, 18th overall, and one upon which Navarro rekindles the spirit of individuality and an enthusiasm that has been sadly lacking for many years on what, for want of a better phrase, I'll refer to as "mundane radio". Composed over days or even weeks rather than hours or minutes, the majority of tracks are lengthy excursions that explore a complex diversity of themes. Challenging at times, each creation is a mini-voyage in the purest sense. From that effort, we selected the optimistic journey entitled Blue Skies, Bright Dreams! This week ... there's fresh listening that includes tracks from trumpeter Allistair Elliott, key-lady Fiona Joy Hawkins, and saxman Kyle Wolverton, as well as a great track from Earl Klugh and The Spice of Life. However, surprisingly that's it for the new music portion of the show as from there on in we've devoted the remainder of the program to the music of one man only - that being Patrick Yandall. We've gone to each of Patrick's releases for a 9-track Then & Now feature; that'll be roughly 20 minutes into the hour - and it's all part and parcel of another great non-stop action-packed fun-filled hour of musical entertainment! Patrick Yandall: Born and raised the son of a jazz musician and a long time spent recuperating from a broken hip, led Patrick Yandall to try both trumpet and guitar at the early age of six. Guitar won out with George Benson and Wes Montgomery becoming major influences. Equally adept at progressive rock and the more complex idiom of jazz, the native of Bay City, Michigan was playing underage clubs by his early teens. In the late 70s, he toured with the fusion group Clockwork, before returning to his study of music. Based on a summer symposium at Berklee and his admiration for the stylings of Jeff Lorber, Yandall has followed a path based primarily in jazz and blues. In the early 80s, he moved to San Diego, but briefly went back east to attend Central Michigan. Later, Yandall hooked up with Devotion, a band in the style of Earth Wind & Fire that boasted a five-piece horn section - in addition, he also established himself as a premier sessionist and performer on the LA-San Diego circuit! Having launched his solo career back in '92, Yandall has turned prolific of late and with the recent issue of Laws of Groovity has brought his cd output total to nine - all which helps set the stage for a Patrick Yandall Then & Now feature. Now, in truth we've actually run this sort of segment before on a couple of occasions, once back in 2006 on edition #407 and before that on edition #341 in 2004. Nonetheless, in that regard, we're back at it but in this case we're maximizing the PY factor by encompassing all of Yandall's projects with a 9-track installment that will not only be the biggest but undoubtedly also our best to date! Beginning with that aforementioned '92 debut, we have in order: Feed the Fire, One Perfect Moment, Marcus Street, On The Cool Side, Heart Promise, and Brazilian Affairs. Even so, we're still only 2/3rds of the way thru. As we span the last three years we're checking on some of Patrick's finest tracks - the title track from Samoa Soul, Yandall's superb cover of The Allman Brothers classic In Memory of Elizabeth Reed from 1970, as well as Viejo Amigo (translating to "old friend") from Patrick's current Laws of Groovity release. Thereby, with this quick synopsis, we hit some of the highlights in and underscore the musical career of one of our "old friends" here at The Café, in Mr. Patrick Yandall!